ID: Green , yellow-green, or almost white disk with tentacles tipped in pink. Grows in dense colonies. Comments: I typically note these beautiful anemones in shallow waters (less than 10 feet deep) where surge or current is prevalent. 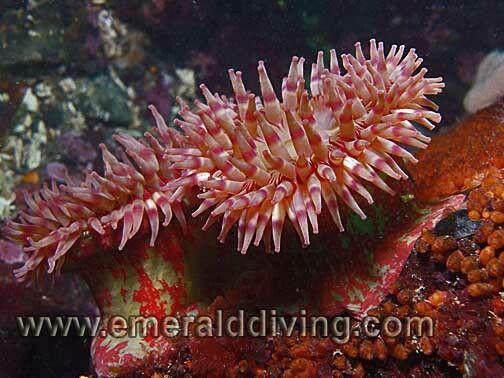 A large colony of these anemones resides at Lawrence Point in the San Juan Islands. 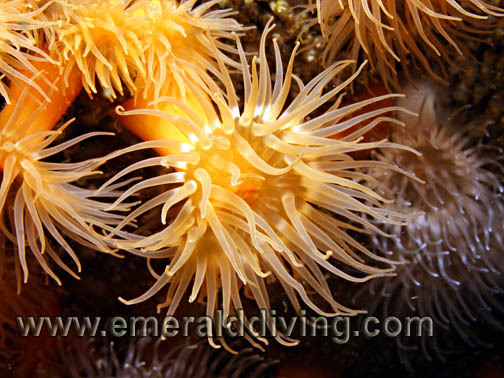 These anemones almost glow when basking in the sunlight at shallow depths. ID: Stalk usually buried in substrate. Short and somewhat thick tentacles that lay flat. Banded pinkish tentacle with olive colored disk center. Comments: I commonly note beaded anemones throughout Northwest waters on sandy substrates, such as at Edmonds Underwater Park. ID: Flat column. Large, solid green disk. 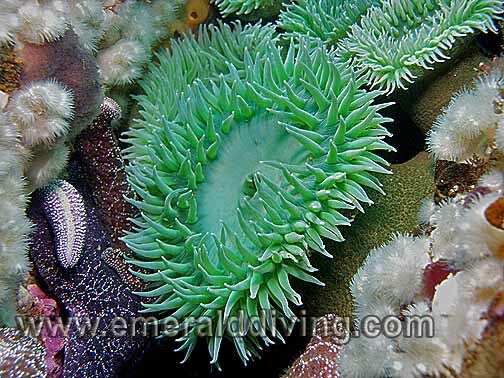 Comments: I only note the green surf anemone in loosely connected groups in shallow rocky areas where surf or surge is prevalent. I do not believe I have noted this speices deeper than 15'. Some of the semi-protected shallows around Tatoosh Island bristle with these anemones. ID: Solid color, translucent tentacles. Color varies and includes oranges, whites, and tans. Often found in dense aggregations. 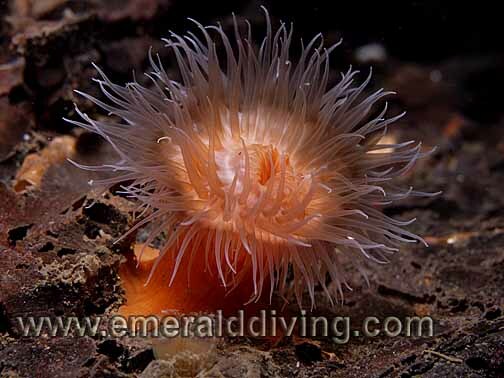 Comments: Another common anemone that is readily found throughout Washington waters. White metridium anemones often dominate large expanses of rocky reefs. Coverage can be so dense that it appears as if the reef is covered in a fresh blanket of snow. onds. ID: Tall column. Solid white, orange, or yellow-green color. 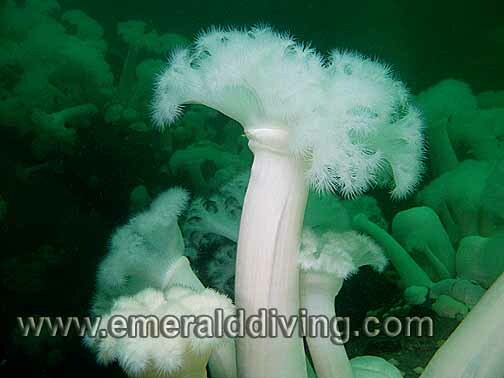 Comments: Giant plumose anemones are a signature species in the Northwest and extremely common. They seem to be able to grow anwhere they can gain a solid foothold. 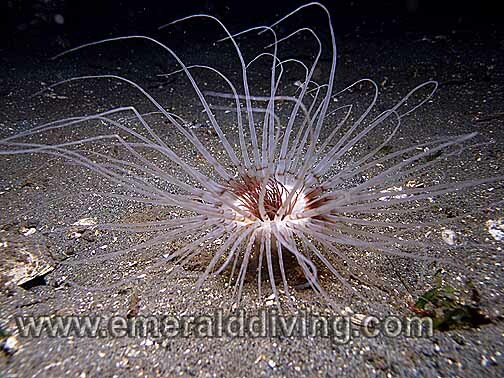 The giant plumose anemone is the largest anemone species in Washintong waters and often grow in dense aggregations. Many walls and reefs are dominated by these giants. ID: Blotchy red, yellow, and/or green colored column. Banded tentacles. Tentacles have same color as disk. Comments: I note the painted anemone throughout Washington waters anywhere there are current swept rocky reefs. This anemone is easily distinguished by the unique blotching on its column. 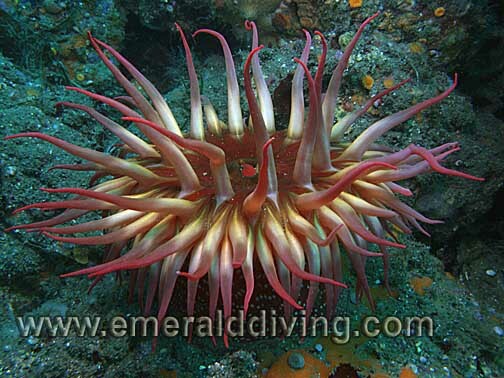 The red and green color of the column has resulted in some people referring to this species as a Christmas anemone. Happy holidays! ID: Short column with long tentacles that often lie flat or droop. Comments: I only note this relatively common anemone on sandy substrates. The sand anemone can grow quite large. 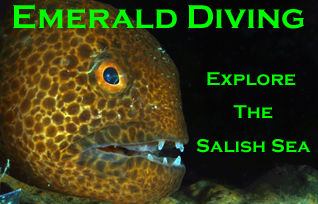 Sections of the sandy substrate at Three Tree Point often harbor several of these beautiful animals, as do the substrates around the wrecks in Shilshole Bay and Four Mile Rock. ID: White and orange body and disk with white and orange banded tentacles. 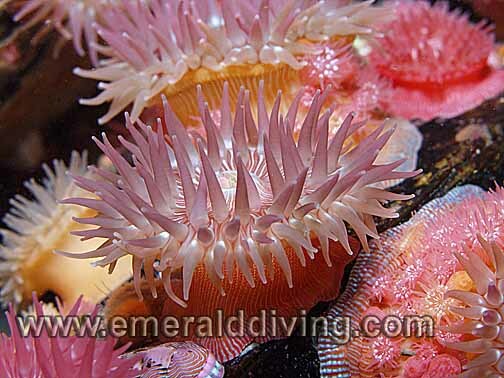 Comments: Swimming anemones are common inhabitant of Washington waters. The amount of orange color can very from animal to animal. This species can actually un-attach from its mount and swim to a new location by undulating its body - a handy trick to use when threatened or the current is not delivering enough nutrients to fulfill the anemones appetitie. ID: Retracts into a tube. Fine inner tentacles, long wispy outer tentacles. Typically white with brown/purple bands, but can also be dark purple with black bands. 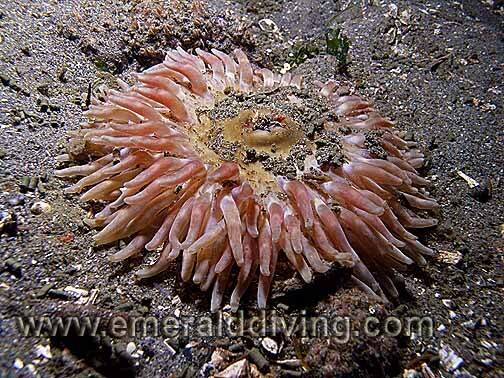 Comments: Tube anemones may be the most common of the sandy-substrate anemones. I have noted incredible dark purple specimens at Gedney Bar. This anemons is a favorite menu item of giant nudibranchs. When threated, the tube dwelling anemone retracts into its fortified tune. ID: Large size. Disk color often different from tentacles. Colors vary and include whites, reds, purples, greens, yellows, and pinks. Intricate lines on disk radiating towards the middle. Column is a solid color. 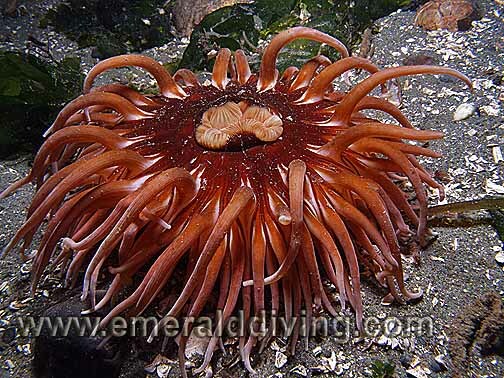 Comments: Large speciemes of the picturesque urticina anemone thrive in rocky, high current areas in the Strait of Juan de Fuca and Cape Flattery. However, they can also be found in Hood Canal. I have seen one specimen as far south as the reef at KVI Tower. 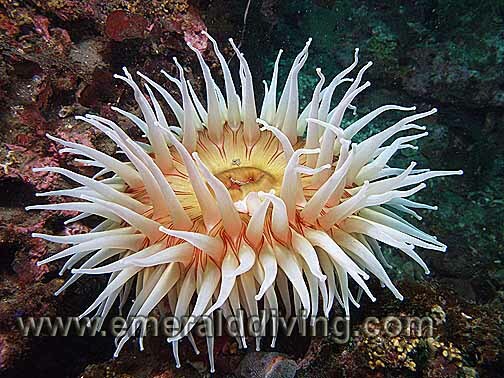 Also referred to as a fish eating anemone. ID: Red column with white tubercles arranged vertically. Disk colors is normally red. Tentacles are usually yellow tipped with pink. 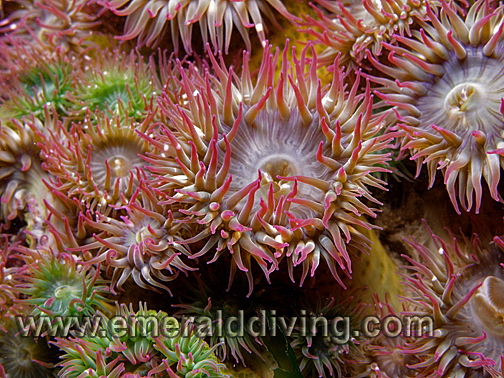 Comments: Fantastic specimens of the spotted anemone are found throughout the Cape Flattery area. When the tentacles are retracts, the white spotted column is very distinctive. Photo taken at Mushroom Rock, Cape Flattery. ID: Ten white tentacles. Column not visible. Comments: The column of this anemone generally remains buried in the sand. When I note this species, there are usually quite a few of them concentrated in area. Photo taken at Sekiu Jetty Rocks in the Strait of Juan de Fuca. ID: Orange color with white band near base of tentacle. Lives in dense aggregations. 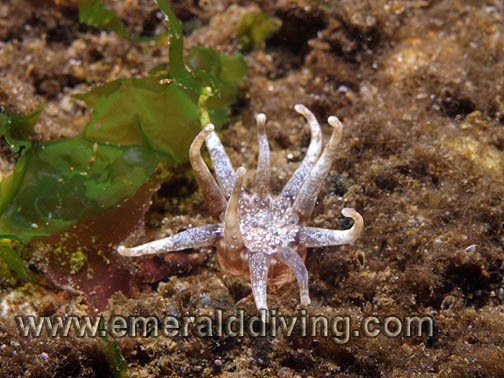 Comments: According to Andy Lamb, this is an undescribed species of anemone found in the northern Vancouver Island area. 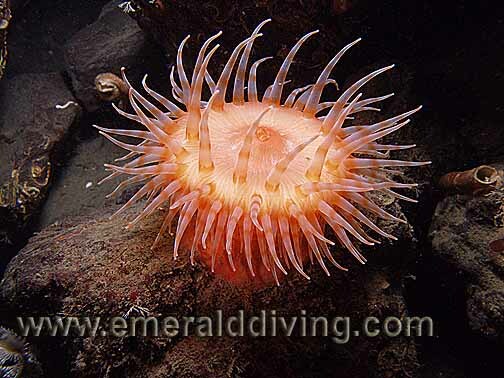 It looks like a zoanthid, but lives at very shallow depths. Photographed in Lucan Channel in Browning Pass in 5 feet of water. ID: White radiating lines on disk, vertical white lines on column. Color varies and includes pinks, oranges, greens, browns, and yellows. Comments: This species typically grows in dense colonies on current swept reefs. Lone brooding anemones will sometimes attach to a blade of kelp or eelgrass. I have seen massive fields of colorful brooding anemone flourishing on top of some of the spires in the Cape Flattery area. ID: Distinctive pink tentacles, disk, and base. Chevron "v"s on tentacles. Color variation from light pink (almost white) to bright pink. Comments: Also referred to as a snakelock anemone. A very common and beautiful species, the base of the appropriately named crimson anemone is a favorite sanctuary of several shrimp species, including the candy striped shrimp. 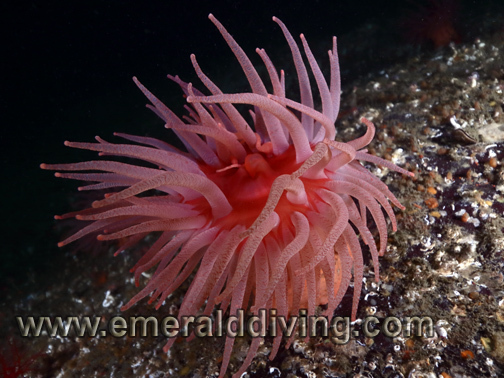 Photographed in Tumbo Channel in the Southern Gulf Islands, BC, Canada.